Children's Entertainer, Andy's Magic, has had another magical busy week entertaining at parties in Bewdley, Stourbridge, Henley-in-Arden near Solihull, Birmingham and Worcester and he's been asked to say a big "Happy Birthday" to Jacob (top left), Grace (top right), Lucas & Eden (bottom left) and Mabel (bottom right). 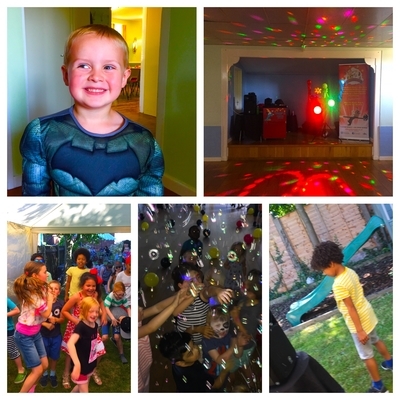 Andy had a great time at all of the parties entertaining the children with his Two Hour Party Package - loads of fun, laughter, magic show, games, prizes, and dancing in the lights and bubbles - all of the great comments he received really did put a smile on his smile. Thanks to everyone for booking and I hope to see you all again soon. As a children's entertainer its easy to for me to see what kids like, the latest crazies they are into, the most popular songs of the moment and the latest trends that are going around. 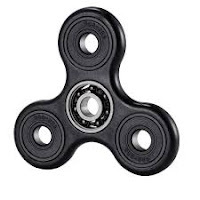 At the moment the most popular toys are fidget Spinners and its because of their popularity that I've introduced them as prizes in my two hour party package. As soon as the kids realize a fidget spinner is up for grabs they go crazy trying to win them. I also make sure that as well as the birthday child helping in the magic show that they also receive one too, if they are appropriate for the age. Every child wants not just one of these mega popular toys but with so many colors, designs and materials to choose from they love to collect as many different varieties as possible. As a child party entertainer I can supply a full two hours of entertainment and the only thing you have to do is get the kids to the party and feed them. So with this in mind I thought I would share this great recipe for delicious Fidget Spinner Cookies that are easy to make and the kids will love them. And the great bit is they don't only look good and taste delicious but they actually spin as well. Watch the video below and see just how easy they are to make. Let me know if you tried out this recipe and what success you had. The weekend of the 17th and 18th July turned out to be the hottest of the year so far with temperatures reaching 32 degrees and its the start 0f a predicted week-long heatwave that will sweep across the U.K. — and it could get even hotter. Because of the gorgeous weather everyone seemed to want their party entertainment outside. There I was performing my magic shows in the gardens that acted as perfect sun traps, and I'm sure I was working in heat well above the officially record temperatures. But as the age old adage goes... "The show must go on" and go on it did. Firstly, I was children's entertainer and magician - Andy's Magic providing the ever popular Two Hour Party Package for Freddie in Webheath near Redditch, Maxwell and Louie in Walsall and Katie in Kidderminster. I was also booked to entertain for the children in Alcester for the joint celebrations of Charlotte's 8th Birthday and Holy Communion. It was hot, sticky, hard work but all went well. On Saturday evening I transformed into Andy Kirk, Magician and entertainer, entertaining with my close-up magic and mind-reading (which is ideal for weddings, christenings and private parties) at Heather's 21st birthday party in Ombersley, near Worcester, by the evening things were cooling down a bit and it was actually nice to be outside. It was a great weekend of magical fun and thanks to everyone for booking with Andy's Magic and I hope you all enjoyed the entertainment. Happy Birthday Heather, Freddie, Maxwell, Louie, Charlotte and Katie - you were all MAGIC! Why does children’s party entertainer and magician, Andy’s Magic get booked time and again for birthday parties and events? 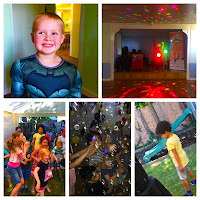 Read the latest 5 star reviews and see what parents from Worcester, Birmingham, Wolverhampton, Stourbridge, Bromsgrove and Kidderminster have to say about this very busy kids party entertainer and magician. “Had Andy for my daughter's 7th Birthday party last weekend & would highly recommend, he was very efficient & kept 30 children entertained for the entire 2 hours making it stress free for me! Erin had a wonderful time as did all of her friends & lots were saying it was the best party entertainer they had ever been to!” — Vicky Townsend, Birmingham. “Brilliant! Kept the kids occupied from the minute he walked in and they all had a great time. every aspect of the party was spot on - bubble machine and magic show were great and the balloons were a huge hit! Would definitely recommend… thanks Andy” — Joanne Harper, Wolverhampton. “Andy kept all the kids entertained at Dylan’s party. The disco is second to none with loads of fun and games as well as dancing in the bubbles and Dylan loved be a star in the magic show. His balloons, that all the children received at the end, were amazing. The best party entertainer I've seen - Highly recommended.” — Jill Willis – Stourbridge. “Thank you so much for my daughters 6th birthday party today, all the kids and even the adults really enjoyed themselves, so thank you very much for making it a very special magic party.” Angela Guy, Kidderminster. "I wanted a party entertainer that would keep the kids happy from start to finish. I hit the jackpot finding Andy's Magic. Brilliant with the kids, they laughed all the way through his magic show and loved his twisty balloon animals. Loads of great comments from other parents. He certainly made my little girls birthday party a massive success. Thanks Andy — Susan Coppes, Bromsgrove. Children's entertainer and party magician, Andy's Magic is about to hit the road for the start of a very busy weekend covering: Kidderminster, Worcester and Stourbridge areas. All children's entertainers are going to be busy, if they're any good that is, but for Andy's Magic, one of the busiest, it's going to fun-filled day with disco, magic shows balloon animals, puppets and birthday party games along the way. Happy Birthday to all those he's entertaining this weekend and to anyone else who's birthday it is. What every you're doing, do what Children's Party Entertainer, Andy is intending to do... enjoy the weekend. Andy's Magic, children's party entertainer, loves Harry Potter, and lets face it who doesn't. Well, Iaaac's party had a great Harry Potter theme from banners to signs and even a superb Harry Potter cake. This party was held near Wolverhampton and what a fab time. There really was no stopping these kids at this party and Issac was a great magicians assistant too. We all had loads of fun. Below is what Issac's Mum thought of the party. A Children's Entertainer Is A Great Birthday Party Idea! There are such a wide choice of things you could choose to do for your child's birthday party: soft play area's, go carting. trampolining, laser quest, a football party, take them to the cinema... the list is endless. But what about booking a children's party entertainer and magician to run the whole birthday party for you, make it stress-free and leave everyone happy too? As a kids party entertainer and magician this is the exact thing I specialize in and there are a few others around who offer similar services to. Booking my Two Hour Party Package means that from start to finish I will entertain the kids, keep them happy and under control. From the moment they walk in the door the music will be playing, the lights will be flashing and bubbles will cascade around. As a children's entertainer with over 26 years experience I just know the children are going to want to join in straight away. Once the the kids have all arrived I'll start with games and competitions. The age range dictates exactly what party games and competitions I use and I've got a wide choice as well including: Pass the Parcel, dancing competitions, The Spot Game, Musical All-sorts (like bumps but a different thing to do each time the music stops) Name That Cartoon (theme music from children's favorites cartoons and programes are played and they have to guess. Each one). I also include action songs like the Hokey Cokey, The Music Man or Superman which are all firm favorites. There will also be a great chance for the kids to dancing in the dancing competition. In my children's entertainer Two Hour Party Package I supply or the prizes and bring the pass the Parcel too. Throughout the party the music played will be age appropriate and include loads of the most up-to-date and most popular hits of the day will be played including All About The Base, Gangham Style, Uptown Funk, and Songs from Disney's Frozen and Trolls. As party entertainer I try and keep in touch with the music that the children might be into. If you have any requests let me know when booking, ill be glad to play your requests. The first half is 45 minutes. Then into the break where I will lead them to the table ready for refreshment. After an exhausting first half this is a great way to calm the kids down naturally and get them ready for The Magic Show that follows the break which I'll get ready while they eat While they are eating I'll bring out Charlie the Monkey (puppet) and walk around saying "Hello" to the Birthday child and all his friends. I finish of the break I'll get all the kids singing "Happy Birthday", let the birthday child blow out the candles on the birthday cake and get three cheers as well leaving you free to take some great photos as it happens. We are now ready to start the magic show, which from start to finish will be crammed full of hilarious comedy magic, loads of fun, laughter and audience participation. Depending on age (normally up to six-years-old, Max the Magic Dog (puppet) will make his appearance, get everything wrong, cause chaos and finally perform some great magic, and Max the Magic Dog is always a massive hit with the children. To finish the party you can choose to have balloons made and given out to all the children at the party — it's a great way to finish a birthday party and guaranteed to have the children leaving the party with 'smiles on their faces'. You can see that it really is a full two hours of fun and all you have to do is to get the children to the party, give them their party food and party bags at the end, if so desired. With Andy Magic, children's party entertainer, The Two Hour Party Package starts from just £185.00 as is a great value for money and is a sure-fire way of making your birthday party stress-free. It'll also give you the time to relax and look after any parents or guardians that stay to watch. whatever you do for your next party enjoy it.